Zuora is the world’s largest provider of Relationship Business Management (RBM) services, empowering businesses to build subscription models that keep customers consistently engaged in long-term relationships. 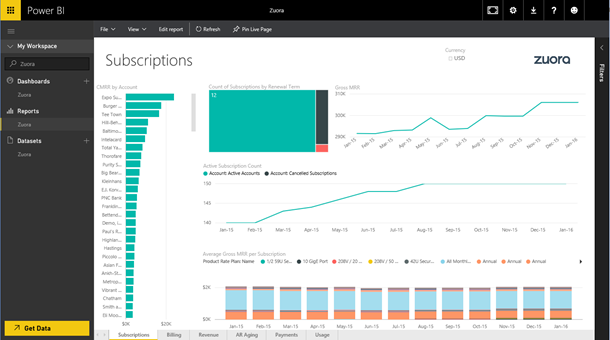 The Zuora content pack for Power BI allows you to visualize key metrics that help you measure the health and performance of your subscription business. Use the default dashboard and reports to analyze usage trends, track billings and payments, and monitor recurring revenue, or customize them to meet your own unique dashboard and reporting needs. 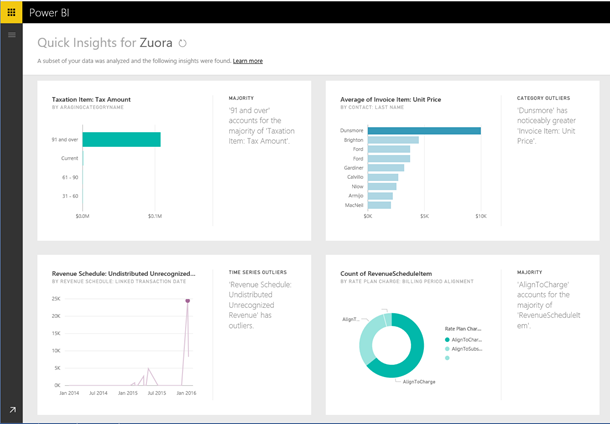 This post will explain how the Power BI content pack can help you analyze your Zuora data. 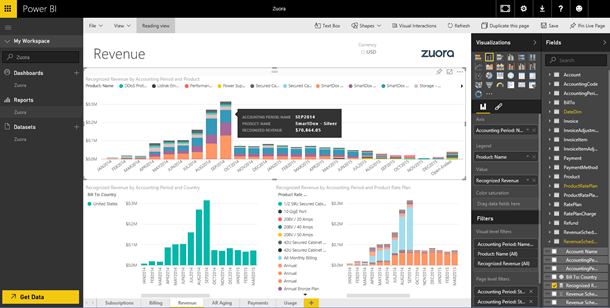 For additional details on how to get started, please see the Zuora content pack for Power BI help page. It’s easy to get connected to the content pack, just provide the Zuora endpoint to get started. Signing in will complete your connection, automatically creating a dashboard, report and dataset with data from your Zuora account. The out-of-box dashboard offers a set of insights and you can select any of the tiles to drill into the 6 pages of reports. For example, if you select the CMRR by Account tile, it brings you to the Subscriptions report detailing how much CMRR is attributed to each customer account, number of new subscriptions versus cancelled subscriptions each month and much more. Once you are on a report you have the ability to hover over the visualizations to see additional details. Note the slicer in the top left to change between currencies if you’re operating in multiple countries around the world. Select a visual to see more details. In each report you can switch to edit mode where you can edit or add additional visuals to your reports. On the left you’ll see a list of all the tables and fields you have access to in the content pack. From any of the reports you can pin the visualizations or tiles to the dashboard by hovering over them and selecting the pin icon. You can also use the Quick Insights feature to see interesting patterns and outliers in your data. Any tiles from the reports or Quick Insights can be added to your dashboard to customize it further. After the initial import, the dashboard and the reports continue to update daily. You can control the refresh schedule on the dataset. 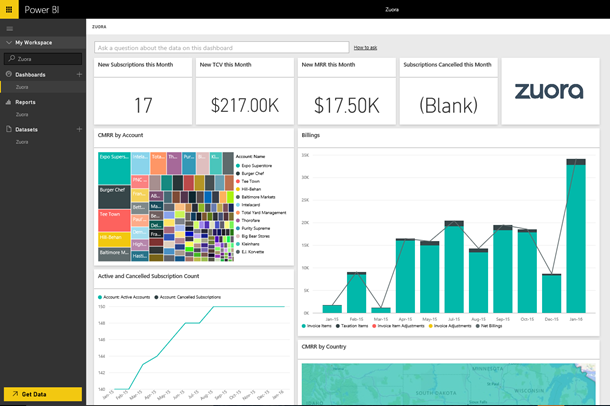 With the Zuora content pack for Power BI, you have an initial set of insights that you can use to analyze your subscription data even further.